We intend to use the net proceeds of this offering to build a large-scale sales and marketing team and open more markets for distribution. In addition, we anticipate continuing administrative, legal and accounting expenses. The CEO’s salary is currently $36,000, but may increase to $120,000. We will also be allocating funds to product development, distribution and support sales, including the hiring of regional account managers. In addition, we intend to use the net proceeds of this offering to distribute on a national level to all 50 states and continue to scale and increase our sales and marketing team.We will hire brand ambassadors to lead off-premise sales and awareness of the brand and increase sales. We will also use 4% of this raise towards the Wefunder intermediary fee. Robert is a beverages expert & industry consultant with more than 10 years experience in the alcoholic beverage space, having expertise in private labeling, brand building, operations & distribution. David came up with the initial vision for Palmia and brought the Palmia concept from a beach in Spain to a viable product with an initial launch in San Francisco. $500+ Investors will be periodically invited to special events, parties, happy hours and previews. $1,000+ Investors will get an Authentic Palmia T-shirt and 10 Palmia Beer Coasters. $50,000+ ($25,000+) Investors will get an Authentic Palmia T-Shirt, Palmia Trucker Hat, Palmia Stainless Bottle Opener, Exclusive Palmia Bartender Bottle Opener, and a private party for up to 50 of your friends with Palmia being served at one of our Partnered Bars in San Francisco. Partnerships with Whole Foods, Target, Total Wine & More, Cost Plus, Sprouts, BevMo! In fact, we are now being sold in Raley's, Sprouts, Nob Hill Foods, Cost Plus World Market and Total Wine & More. 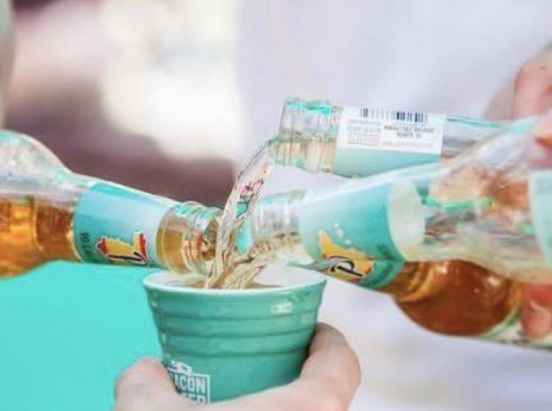 Sold in more than 150 California stores and 30 bars and restaurants less than a year after launch and recently opened distributor accounts in Oregon. Successfully raised $204,565 from 288 Wefunder investors in July 2017. Sold in some of the most recognizable bars and restaurants in San Francisco, including Sabrosa, Delarosa, Tacolicious, Monaghan’s, Dosa, Chubby Noodle, Blue Light, and more. Partnerships with LYFT, San Jose Sharks, and SAP Center. Connections to Bottle Rock, Coachella, Life is Beautiful, ESPY's, and other large venues and events. Winner of the 2018 People's Choice Award for the "Best Beer" at the Fremont Chamber of Commerce Burger and Brew Fest, beating out 38 other beers. Recently signed with four distributors outside of the Bay Area -- Morris Distributor (serving Sonoma County and San Francisco), Chrissa Imports (Counties: San Mateo, Santa Clara, Contra Costa, Alameda, Santa Cruz, Monterey and San Benito), Sacanni Distributing Company (Counties: Sacramento, Amador, Butte, Colusa, El Dorado, Glenn, Lassen, Modoc, Nevada, Placer, Plumas, Shasta, Sierra, Solano, Sutter, Tehama, Yolo, Yuba, and Alpine, outside of Lake Alpine and Bear Valley), Siskiyou, (East, Trinity – East) and Point Blank Distributing (Portland, Eugene, and Bend). We now have 83 total sales representatives.